This is the tale of Greenville’s first fire engine known as the Water Witch, and its unexplained disappearance during World War II. Rumors and speculation surround the mystery. Some have claimed she was lost to a scrap drive during the war, while others, in a twist of irony, believe she was destroyed in a barn fire. Still others have ventured she was sold to a private collector. And some believe she is still around, hidden away in a neighboring town. Whatever the case, those who know her true fate have refused to tell, while others have continued to search. Perhaps someone reading this can help solve the mystery. It all began with a thunderstorm that swept through Greenville on the night of June 20, 1870, during which lightning set fire to Whipple’s Wheelwright Shop in the heart of the village. Volunteers formed a bucket brigade, but the flames spread quickly, and before long an adjacent building owned by Barnes & Sprague was also ablaze. A newspaper report of the incident stated that a man named Martin was badly injured when he fell from a ladder while helping to remove items of value before the flames could consume them. Both buildings were a complete loss, and only one was partially insured. Besides being a blow to Greenville’s economy, the blaze made it clear that the village needed something better than bucket brigades in the way of fire protection. Over the next few days, Martin Mann of Greenville began soliciting donations to purchase a fire engine. At a special meeting held in the Greenville Baptist Church he announced that he had collected pledges of $366.00 thus far, and urged others to contribute. Mann had also taken it upon himself to locate fire engines that might be for sale, and after some discussion it was decided that a hand-tub engine belonging to the Dexter Hose Company of Pawtucket would be best suited to the needs of the village. The fire engine was purchased for $475.00, with additional money spent on hose lines. It arrived in Greenville on July 4th amidst much fanfare which included a parade, a brass band, and refreshments served on the common. The engine was dubbed the Water Witch, although it’s unclear at this time weather the name was given by those of the Dexter Hose Company, or by the citizens of Greenville. The Water Witch was a “hand-tub” that required a team of strong men to operate – at least five men on each side who would operate long pump handles to draw water from a pond or cistern, while other firemen directed hose streams at the flames. She would arrive at a fire being pulled by a team of horses or men with ropes. Such apparatus were already obsolete by 1870 with the advent of steam powered fire engines, but still a great improvement over bucket brigades. 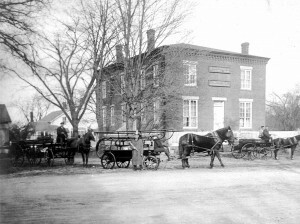 It could be said that the arrival of the Water Witch was the beginning of Smithfield’s fire department as we know it today, for it was the first fire engine in what is now Smithfield after the town was divided in 1871. 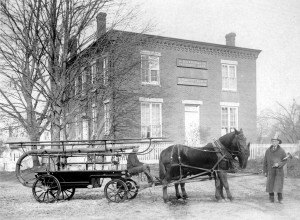 Greenville’s fledgling fire company was called “The Rescue Fire Engine Company”, and Andrew B. Whipple was elected the first fire chief. Martin Mann, whose efforts were responsible for obtaining the Water Witch, was elected First Assistant Forman, a title known today as Deputy Chief. The Water Witch was first housed in a barn owned by Mrs. Abby Evans, but in 1885 it was re-located to the basement of the National Exchange Bank of Greenville. This sturdy brick building still stands on Putnam Pike at the intersection of Smith Avenue. Thanks to the Water Witch and the men of the Rescue Fire Engine Company, some notable landmarks were saved. Among them were the Resolved Waterman Tavern, and the Greenville Baptist Church, both of which were hit by lightning, as well as several “historic” homes that still remain standing. 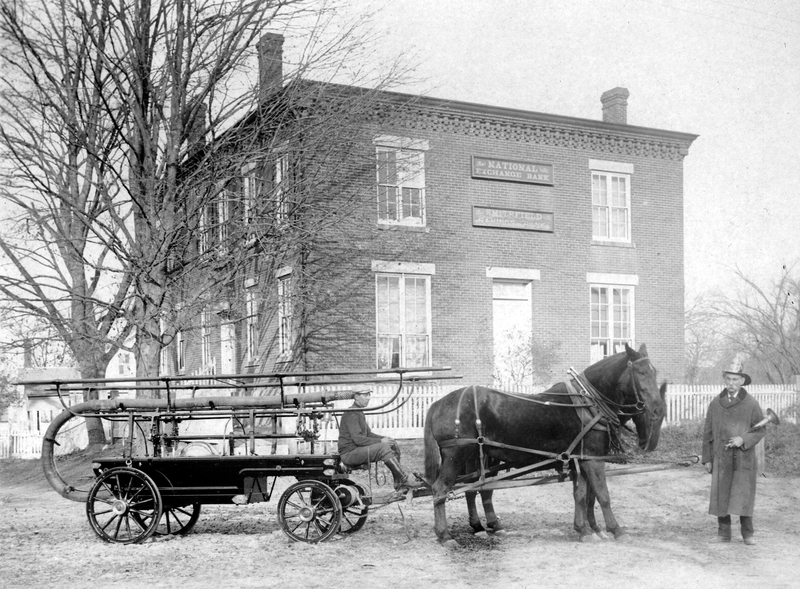 The Water Witch served Greenville for many years until motorized fire engines made even “steamers” obsolete. Firefighters are a traditional lot, proud of their history, and dedicated to preserving it. It is for this reason that the men of Greenville decided to keep the historic Water Witch for parades and special functions. During the 1920s and ‘30s the Greenville Fire Company (as it came to be called.) began to acquire motor driven fire engines and quickly outgrew their fire station under the bank. By 1939 the organization had moved into a new fire station on Putnam Pike which is still in use today. 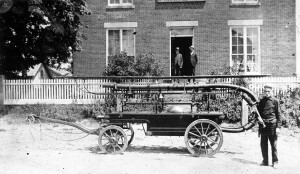 Oral history of the Greenville Fire Company states that by the late 1930s storage space for the Water Witch became a concern, but the problem seemed to be solved when members of the Chepachet Fire Company asked to use the vintage fire engine in Glocester’s annual Ancients and Horribles Parade. The engine was loaned on the condition that Chepachet store it for the time being. Then the United States was drawn into World War II and the young men of both communities left to serve their country. It wasn’t until after the war that men from Greenville went to retrieve the Water Witch only to be told that it had disappeared, and nobody seemed to know what happened to it. Inquiries were made, but to no avail. Some said the old fire engine had been discarded to a scrap drive during the war, but it seemed unlikely that Chepachet’s firefighters would have allowed the destruction of such a valuable and historic antique. For the next twenty-plus years the fate of the Water Witch remained a bone of contention between the two towns. In 1970, as the Greenville Fire Company made preparations to celebrate its 100th Anniversary, a renewed effort was made to recover the long lost Water Witch. Information was received from a Chepachet resident that she was hidden in a barn at a Glocester cemetery, and men from Greenville went to investigate. At first the caretaker reportedly refused to allow anyone to look inside, but later, when permission was granted, all that was found was an old horse-drawn hearse. The matter was never resolved, and in later years a rumor circulated that the Witch had been stored in the barn of a “collector”, but the barn had reportedly burned down and the old gal was lost at that time. The exact location and date of this fire is unknown. Another story surfaced that she was sold to a collector in Coventry who later donated her to a museum, but this was never verified. The mystery was brought to light again in a 1987 Providence Journal article titled; “Fire Officials In Two Towns Disagree About Who Owned A Lost Antique Fire Truck”. According to the article, both Chepachet and Greenville were claiming ownership of the missing fire engine! Members of the Chepachet Fire Department at that time had been told that it was Greenville firemen who had borrowed the engine from their station and never brought it back, however the Chepachet fire captain who spoke with the reporter acknowledged that he didn’t know if the story was true or not. The article went on to point out that neither town had records to prove ownership which would seem to leave the matter in legal limbo should the Water Witch ever be found. However, research has uncovered information that seems to support Greenville’s claim. Newspaper articles from the Woonsocket Patriot, report of the lightning strike to Whipple’s Wheelwright Shop in Greenville, the subsequent purchase of a fire engine, and the formation of “The Rescue Fire Engine Company”. Additionally, publisher and historian Laurence J. Sasso Jr. researched and later wrote about the history of the Greenville Fire Company in a 100th anniversary supplement published in The Observer on October 1, 1970. His extensive article, which spanned twelve pages, included information about the Water Witch that was gleaned from original hand-written Greenville Fire Company records. Furthermore, there are at least three different vintage photographs known to exist depicting Greenville firemen posing with the Water Witch in front of the old National Exchange Bank of Greenville. All three images pre-date World War II. Ownership aside, the original question still remains; what happened to the Water Witch? In recent years the rumors have quieted to a whisper as those with first-hand, and even second-hand knowledge fade away. There are those who believe the Water Witch still exists, perhaps hidden away in a secret location known only to a select few, and it is for this reason that they continue the search. 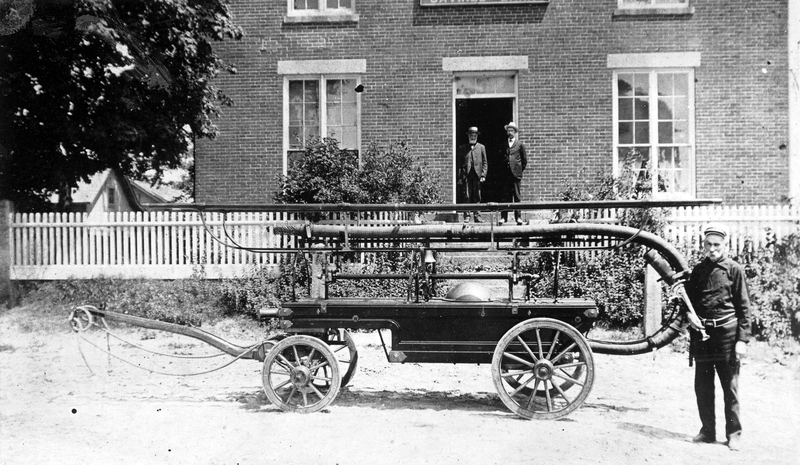 The last active search for the missing antique fire engine took place in 2006 when a delegation of aging Greenville volunteers once again tried to solve the riddle. Unfortunately they were unsuccessful, and while some have since passed away, the mystery lives on.